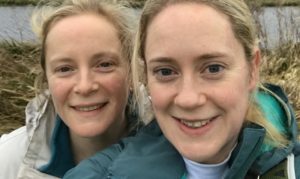 “Three weeks on Thursday we will take on our 100 mile Cotswold Way Challenge…I can hardly wait!” says our intrepid fertility nurse specialist Rowena Haslett Fossey as she plans her next challenge. Last year she and friends completed 100km from London to Cambridge as part of the Ultra Challenge and said ‘never again’… until this time, as she explains. I have teamed up with just my sister this year to tackle a new challenge to help raise money for Arthritis UK in memory of our wonderful mum. We are going to embark on a 100 mile run/walk in the Cotswolds 9th-12th June – although advertised as a 100 mile run the organisers have recently informed us that the route is in fact 107 miles (apparently that is not such a catchy title! ); those 7 extra miles we could have done without! We have been training hard over the last 6 months, walking in snow, rain, freezing temperatures and over a variety of terrains trying to prepare for what will be a gruelling four days. The dog is exhausted and covers her eyes with her paw every time she sees me get out my walking boots as if to say, please not again! This weekend we completed the London Moonwalk (26.2 miles overnight) to aid preparation for the real event in June and it was a good test of how fit we are – or not! We will have a rest this weekend and then set out on our last training walk from Bishop’s Stortford into London (34 miles), which is the distance we have to do on the last day of our challenge. On our 1st day of walking in June we will walk/run 17 miles then camp overnight, the 2nd day will be a 27 mile distance followed by more lovely camping, 3rd day 29 miles and yet more camping, and the final day will be 34 miles walking/crawling where we hope to end up in Bath to have a nice hot bath! We hope to raise £2000 for Arthritis UK and have a way to go before we reach our target – any help with sponsorship would be extremely gratefully received. We will keep you posted on how the final preparations go over the coming weeks. Here is the link for our sponsorship page if any of you are able to sponsor us: www.justgiving.com/Rowena-Haslett-Fossey1. Any amount, no matter how small, makes a difference. Thanks again for the support, it means so much to us.